At age 67, George Martin is one of the longest–lived architects of rock ‘n’ roll. Born in London, he was an oboe player and composer of classical melodies who found steady work as a staff producer and conductor at EMI’s recording studios at No. 3 Abbey Road. In the ’50s and early ’60s, Martin’s pop successes included hits by singer Matt Monro, and comedy discs by the likes of Peter Sellers, Rolf Harris and Beyond the Fringe. He was 36 and bored with his job when Brian Epstein presented him with the Beatles’ demo recordings. Every other label in England had turned Epstein down, but Martin–with his keen ear for melody and complex harmony, and an affection for warmth and humor–heard something that no one else had. The middle part of this story is blood–familiar to every Beatle person worth his salt (or, should we say, his pepper). Martin shaped, developed, encouraged, discouraged and forged the Beatles’ sound over their nearly eight–year relationship. He arranged almost every song they ever recorded, wrote all the orchestral scores (with a few exceptions) and–save the Let it Be debacle–is listed as producer on every single Beatles record. Martin has written and recorded numerous instrumental works over the years (most of them Beatles–related) and, in those heady days of 1963–64 produced many, many chart–toppers for British artists (the great majority of them managed by Epstein). After the Fabs’ breakup, he went on to man the boards for America, Jeff Beck and others, and he produced a triumvirate of Paul McCartney solo albums in the ’80s. Most recently, he handled production chores for the original cast album of Tommy, at the behest of Pete Townshend. That’s all well and good, but if George Martin had never crossed paths with the Beatles (and they with him), his work with other artists would be little more than a footnote in the book of rock ‘n’ roll. His credits are a mile long, but one stands head, shoulders, knees and toes above the rest. He was truly the Fifth Beatle, one of the most important figures in popular music history. His contributions may never be fully absorbed. Although AIR Studios, which he began in 1966 (contracting out to the Beatles and EMI until 1970) is still operational in London, its branch on the Caribbean island of Montserrat was destroyed by 1989′s Hurricane Hugo. This year, Martin supervised the digital remastering of the anthology albums, The Beatles 1962–66 and The Beatles 1967–70 at EMI. His Beatles work, as you’ll read in this interview, is far from over. Bill DeYoung: John Lennon used to say that when he heard a Beatles song, it automatically brought him back to the recording session, what he was playing, how he was feeling that day. Is it the same way for you? George Martin: Not really. Looking back at all the songs, it’s a long time ago, and I purposely over the years hadn’t looked back at the songs. My life has been so busy, I’ve tended to go on and look at tomorrow rather than today, or even yesterday. And I find that you can get too obsessive about the past. I did find, however, that when I did that television program on The Making Of Sgt. Pepper a couple of years ago, that of course forced me to look back and see what was going on. And it was the first time, to be honest; in all those years I’d really looked back and started thinking deeply about the past. When I think of a song – if you play me “Paperback Writer” or “Norwegian Wood” – sometimes I will think about things…in the case of “Norwegian Wood,” it immediately brings it back to a hotel in St. Moritz, where John and I had a skiing holiday together. And he wrote the song during the time there, so that’s obviously very evocative. But if you take a song that doesn’t have that particular kind of nostalgia, it’s a kind of blur. “Fool On The Hill,” I can remember how we did that…but there were so many, and there are so much of them, that it’s all one sort of melting, shimmering haze. Bill DeYoung: You played piano on a lot of songs during the early years; it’s particularly evident on the ‘Hard Day’s Night’–era tracks. Was that literally because no one else could do it? George Martin: To begin with, of course, none of them knew what a keyboard was like. They were guitar players. When I first met them, I was aware that they were guitar men and I was a keyboard man. And if you’re running through a new song for the first time, a guitar player will look at another guy’s fingers and see the shapes. You can see what the guy’s doing on the fret, and you know what chord he’s playing. If you then take that guitar player, and he doesn’t know anything about keyboards, what you play on the piano will be completely meaningless to him. He won’t understand the chords at all. And a keyboard player, if he knows a bit about guitar, won’t understand what the chords are by looking at his hands. There’s a hidden language there. So I actually said to myself, “Hey, I’m going to have to learn the guitar, because I’ll need to communicate with these guys on their level.” And Paul, at the same time, said the same thing to himself: He said, “I think I’ll have to learn piano, to see what George is up to.” Because what I used to do, whenever Paul or John sang me a song, I’d sit on a high stool and they’d play it in front of me. And I’d learn it, and I’d then go to the keyboard and I’d say, “Is this is?” and I’d play through the chords and hum the tune. And they’d say, “Yeah, that’s fine, Okay,” and I’d know the song. Bill DeYoung: That piano sound was very distinctive. George Martin: Piano’s a very useful instrument. And, of course, Paul was the one who actually took it up and learned it more quickly and more adaptably than anybody else. I mean, he’s such a fine, versatile musician; he could play almost any instrument if he set his mind to it. So that by the time he got to “Lady Madonna,” he was doing a bloody good solo. He couldn’t possibly have done that in 1962. And John never really mastered the keyboard. His idea of playing the piano was having a group of triads – you know, three notes that formed a chord – and just go up and down the scale with them. He could play rhythm all right on keyboard, but he wasn’t very clever at doing single notes or lines. Bill DeYoung: It’s been theorized that your classical music background, and your work on comedy records, were big factors in making the unprecedented new pop sound that you made. George Martin: I tried to turn them on to it. We did get counterpoint into their work. I remember during “Eleanor Rigby,” which was quite a breakthrough in a way, when we were actually recording it I realized that one of the phrases could work against another phrase, that, they hadn’t designed that way. In other words, “Ah, look at all the lonely people” actually could come at the end of the piece. Which it does. I put it in; got them to sing it…they were knocked out by that. “Hey, yeah, those two things go together! It’s great, innit? It works well.” It had never occurred to them; never occurred to Paul. But that was a lesson for him. Because I’m sure that when he came to write “She’s Leaving Home,” that was, definitely, two lines working against each other. It was one broad melody, and another one kind of answering underneath it. He leaned how to use that weaving of lines. Bill DeYoung: They were like sponges, in a way, weren’t they? George Martin: They learned so quickly. But when I first met them, I had absolutely no idea at all they could write decent material. They wrote songs that were pretty awful – “One After 909,” and “P.S. I Love You” and “Love Me Do” was the best of them. It was pretty rough stuff. I didn’t really blame the guy who turned them down so much. In fact, everybody turned them down, more or less, on the grounds that their material wasn’t very good, I imagine. Bill DeYoung: Do you remember exactly when they stopped being your students in the studio and started pretty much calling their own shots, coming to you simply for advice? George Martin: There was no one moment. It was a gradual drift. By the time we got to a song like “Walrus” or any of John or Paul’s later songs, they would have very definite ideas on what they wanted to do, which they hadn’t to begin with. It was a gradual drift so that they became the teachers, almost at the end, and I was the pupil. What I do remember, though, was that having rejected all the stuff that they had, and accepting only “Love Me Do,” I had actually rejected “Please Please Me,” in those very early days of 1962, saying “This is no good, this song, it’s very dreary. If you’re going to make anything of it at all, you need to double the speed and really put some pep into it. Make something really worthwhile. Maybe use some harmonica on it.” Because when they played it first to me, it was Paul singing a very kind of winsome, Roy Orbison slow ballad. Which was very dreary. Well, they learned from that, because when I gave them “How Do You Do It,” and we made a record of that, they still wanted to have their material. They said, “We’ve been working on ‘Please Please Me,’ we’d like you to listen to it.” And the result was good. And that gave them an incentive, then, to do better things from that moment onward. George Martin: I don’t think so. I don’t think they ever rejected anything I said. All of us in the studio, including Ringo, had equal voices. And the five of us would look at things and try to make things better. They were much more fruitful by this time, so that if I did have something that I didn’t like…in the case of “Hey Jude” I said, “Do you think we’re being a bit unwise, going on for seven minutes?” And Paul said, “No, it’s there. Can you get it on a record?” I said, “I can get it on, but it’s not exactly a single. DJs will fade it.” I was being practical, and I was wrong, because he was right, because it was right that it should be seven minutes. And it always has been, ever since. “Do you want me to audition for you?!?! !” he said, jokingly. And he swallowed. That had never occurred to him. By this time, all of them had got to the stage where everyone revered them so much that they hadn’t quite thought anyone would dare to suggest that anything they did wasn’t terribly good. There was a kind of distant silence. But Paul is a sensible and honorable fellow, and he said, “All right, you and I had better talk about it, and we’d better sort them out.” And we did, and we made a very happy album. I think that people, when they become superstars, they have to have someone to tell them…they’re surrounded so many times by people who tell them they’re the greatest thing in the world; they need to have an honest opinion. It’s the emperor and his new clothes, isn’t it? Bill DeYoung: Near the end of the Beatle years, did you consider yourself friends? Or was the relationship like that of an employee to an employer? This was White Album, Abbey Road time. 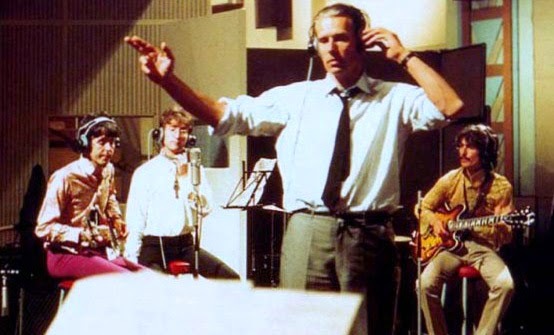 George Martin: The White Album was a funny one, because at the time they came back from abroad and they all had a huge collection of songs they wanted to record. And they wanted them done all at the same time. By this time, they were four individuals with their individual songs, wanting to record them with the assistance of the other people, rather than being a group. I couldn’t cope with it all at once. We were actually recording in a couple of the studios at the same time, identically. John would be in one studio, and Paul would be in another. And I was running from one place to another. I had a very able assistant by this time, a guy called Chris Thomas, who’s now a first–class producer. We shared the work, so I would come in and see what he was doing, and supervise and so on. But it was such a frantic time; I never really worried about any sort of splits there. The real cracks appeared during Let It Be. That was the worst time. Bill DeYoung: With regard to the White Album, you’ve said that you tried to get them to cut it down to a single–disc, 14–track album. What would you have cut out? I’m not saying we wouldn’t have recorded those other songs, but I would like to have made a really great album out of the best of the stuff there, and concentrated and worked very hard on them. But they wanted everything done at once. I thought they were dissipating their energies rather than focusing them. That was my concern. There are one or two items of dross on the White Album. George Martin: “Birthday.” Well, there you go. You’re picking them for me! There are songs that are not at the front rank, put it that way. From other groups they probably would be front rank, but these are my boys, they’re the greatest in the world, and that’s the way I saw it. Bill DeYoung: The songs that remain unreleased today: “Leave My Kitten Alone,” “If You’ve Got Troubles,” “That Means A Lot.” Was there a sense while you were cutting them that they were hopeless? Or were they just culled at the end of the sessions? George Martin: There were many instances when they would come in and not get very good results. I don’t remember the specific circumstances; quite often, they would be done at the tail end of sessions, or sometimes they would be done because they came into the studio and they didn’t have anything else. Bill DeYoung: Would you like to see that stuff released? George Martin: Now that all the water’s gone under the bridge and everybody’s much older and wiser, we are actually now looking at putting out a kind of definitive, all–encompassing Beatle Anthology. They’ve certainly been doing it on film; the boys themselves have been collecting a hell of a lot of footage and interesting visual programming. They’ve got about six hours assembled so far. And toward the end of next year, or maybe 1995, there will be the beginnings of a television series of hours. It’ll be tracing the history of the boys from when they were kids right through to the dissolution in ’70. Now there will be an accompanying series of albums, which will go alongside that. But they won’t be the soundtrack, because the soundtrack will be spasmodic and so on. They will be complementary rather than identical. And for that, I’m going to delve, and I’m going to look at every source–bootlegs that are in good condition. I’m going to look at radio broadcasts, live performances, demo records, all sorts of things apart from anything else we did in the studio, and I shall collate, polish, look at, criticize, chuck away, but maybe issue anything that I think is worthwhile, that actually traces their history. Bill DeYoung: The bootleg CDs that are out now, some of the stuff is pretty phenomenal. George Martin: So I understand! And where the material came from in the first place is most interesting. I’d love to know. I’ve heard some of it, and some of the quality is remarkably good. Bill DeYoung: You don’t think anyone knows how they got out? George Martin: I think all these things will probably be incorporated in what I’m talking about. It doesn’t make sense for them to go out on bootlegs, does it? Bill DeYoung: In his 1970 Rolling Stone interview, John made several disparaging remarks about Beatles recordings, what he called the “Dead Beatles sound.” Did that hurt your feelings at the time? George Martin: Very much! John went through a really crazy period. I was very incensed about that interview. I think everybody was. I think he slagged off everybody, including the Queen of England. I don’t think anyone escaped his attention. He went through a very, very bad period of heavy drugs, and Rolling Stone got him during one of those periods. He was completely out of it. John had a very sweet side to him. He was a very tender person at heart. He could also be very brutal and very cruel. But he went through a very crazy time. The tragedy of John was that he’d been through all that and he’d got out the other side. And he really was becoming the person that I knew in the early days again. I spent an evening with him at the Dakota not long before he died, and we had a long evening rapping about old times, which was marvelous. That’s now my happiest memory of him, because he really was back to his own self. Bill DeYoung: You were recording Tug Of War with Paul the day John died. Just for the record, where were you when you heard about it? George Martin: I lived about 80 miles west of London, and he (Paul) lived 70 miles south. We were both in our respective homes. It was six o’clock in the morning, and somebody rang me from America and told me the news, which was not a good way to start the day. I immediately picked up the phone and I rang Paul, and I asked if he’d heard it. He had heard it. So we went into AIR studios in London. We were supposed to record that day. Of course, we didn’t put down a single note, because we got there and we fell on each other’s shoulders, and we poured ourselves tea and whiskey, and sat round and drank and talked. And we grieved for John all day, and it helped. At the end of the day we went back to our homes. Now, one of the ironies and one of the bitter bits about life is that Paul, when he came out of the studio, of course was surrounded by reporters and journalists. He still was in a deep state of shock. They photographed him, and they flashed him, and they said him the usual sort of zany and stupid reporter questions. The question was, “How do you feel about John dying then, Paul?” I don’t know what you’re supposed to say to that. And he looked and he shrugged and he said, “Yeah, it’s a drag, isn’t it?” And went off into the night. And he was slated for that. He was mercilessly attacked saying, “How callous can you be?” And I felt every inch for him. He was unwise, but he was off his guard. It was tough. Bill DeYoung: You recently scored Paul’s song “C’Mon People.” You must have a pretty good working relationship with him. George Martin: I don’t produce because I’m too old and he’s a good producer anyway. I don’t want to produce. In fact, he’s asked me if I would. But life’s too short. But he had this song and he said, “Would you mind doing a bit of scoring for me?” So I listened to it and I said, “Okay, why not?” And it was fun. It’s nice occasionally working together. I wouldn’t want to make a habit out of it. Bill DeYoung: You’ve done a lot of remastering and CD transfer for EMI on these Beatles projects. When you get to the Phil Spector songs, “The Long And Winding Road” and that, are you ever tempted to twiddle the knobs and just wipe out those strings and choirs? George Martin: (Laughing) You bet I am! It’s a silly thing, really, because that was a wounding thing. And I don’t honestly think those tracks are as good as we should have made them. But hell, they were there, and they’re history now. If you’re a sensible bloke, you just say, “That’s it.” And obviously, when you’re transferring to CD, it’s got to be as it was when it was issued, and that’s the end of it. Bill DeYoung: Maybe you’ll get to change some when you do this anthology next year. George Martin: Well, you can’t really change the artistic content…that would be wrong. My brief was to try and reproduce on CD what we heard on analog. That was my prime motive, to try and make it sound, on CD, with the same warmth and quality we have on analog. Which is not an easy thing, by the way. So when it comes to the question of changing things, no, if I changed it, I would’ve re–scored it, and all that kind of thing. Bill DeYoung: On the American LPs, they added all that echo and awful stuff. Did you used to hear that, and throw your hands in the air? George Martin: Of course I did, but I was powerless to do anything about it. Capitol ran the roost. And they used to take the credit for it too. Bill DeYoung: Do you know why they did those things? George Martin: Ego? I don’t know! I mean, there’s a guy who actually put his name on the records, saying he produced them. So you tell me. Eventually, when we do this anthology thing, then we’ll go back over all those albums and make sure they’re in the right order, and in the original versions as well as other stuff. It’ll be quite a big job, but it’ll be fascinating to do. The last thing I’ll ever do with the Beatles. Bill DeYoung: You think so? George Martin: I guess so. The final thing. The final solution. Bill DeYoung: So you’re content with being known as The Beatles Guy now? George Martin: Well, you can’t escape these epithets. You get pigeonholed. Some people think I’ve never done anything else.